With a vast 84 million hectares of arable land, 279 billion cubic meters of surface water and an estimated current population of 165 million people that is projected to reach 470 million by 2050, Nigeria has been described as an untapped potential agricultural power house. The Provost, Federal College of Agriculture, Akure, Ondo State, Dr. Samson Odedina, disclosed this during the lecture titled, “Agricultural Value Chain Job Opportunities: Success Stories Among Youths in Nigeria”, at the Investiture Ceremony of Award of Excellence in Food Sustainability, conferred on the Director, Grants Management (DGM), Professor Kolawole Adebayo by the National Youth Council of Nigeria (NYCN), Ogun State Chapter. He said that there was huge investment opportunity for import substitution as Nigeria imports over US$11 billion in wheat, rice, sugar and fish every year. According to him, “Import dependency is hurting Nigerian farmers, displacing local production and creating rising unemployment”. 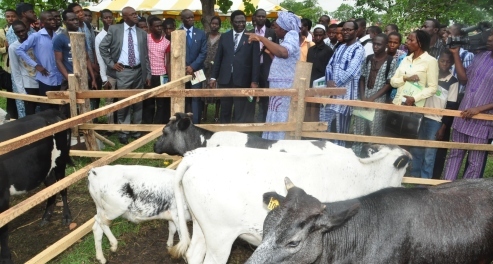 Commenting on the targets for agricultural transformation in the country, he said 3.5 million jobs could be created within agricultural value chains, while describing value chains as full range of activities, which were required to bring a product or service from conception, all through the different phases of production. He disclosed the huge opportunities were inherent in some agricultural products such as cassava in terms of stem production, weed control, root production, bulking agency, transport services, primary processing, value addition and product development like starch, flour, confectioneries, bread, glue, beer as well as marketing. He added that opportunities in aquaculture could also be exploited through fingerlings production, feed production, processing, value addition, product development as well as marketing. Dr. Odedina noted that cocoa could be taken advantage of, in the aspects of seedling production, weed control, pest and diseases control services, bulking agency, processing, value addition, product development and marketing. The Acting Vice-Chancellor, Professor Ololade Enikuomehin, said that the event was a laudable one as it was meant to celebrate excellence and create a platform for motivation. “As a University, we believe in oneness. We believe in celebrating people that has made their mark and made it possible for others to be motivated. I want to thank the National Youth Council of Nigeria; Ogun State Chapter, for finding it fit to honour us as a University, as personified by Professor Kolawole Adebayo. He is a typical FUNAABite, having acquired all his relevant degrees in FUNAAB”, the Acting Vice-Chancellor added. While advising Nigerian youths, the Acting Vice-Chancellor enjoined them to be resolute, by devoting their energy into changing and doing well in whatever they were billed to do, adding that when the youths spend quality time complaining about situations, they lose out on the opportunities around them. He, therefore, encouraged them to take advantage of the various opportunities in this country, saying that children were still being born everyday, as he expected them to survive, as there was strong hope that they would survive. He stressed that youths should channel their energies towards doing essential things. The Chairman of NYCN, Ogun State Chapter, Prince Adeleke Adebajo, said that the Council was established by an Act of Parliament in 1964, to coordinate young people towards global standards in the realisation of their full potentials, dreams, aspirations and being responsible to themselves, in addition to contributing positively to the development of their communities and the nation at large. Responding to the award, the Director of DGM, Professor Kolawole Adebayo, appreciated the Council for the laudable gesture, charging others that it was an opportunity to do good things and not expecting a reward back. “I must appreciate those who have spent time building up with me”, he noted. Professor Adebayo said that in the journey of life, people often meet their life partners, as he admonished youths to treat everybody well and remember each other when they get to the top.